The Annual General Meeting of Schaeffler AG 2018 was held on Friday, April 20, 2018, at the Frankenhalle in Nuremberg, Germany. The speeches of the chairman of the Supervisory Board and the Chief Executive Officer are available as webcast. The annual general meeting is the meeting of the shareholders of the company. Holders of common shares and holders of common non-voting shares may participate in the annual general meeting personally or through an authorized representative. Holders of common non-voting shares may participate in the special meeting of the holders of common non-voting shares personally or through an authorized representative. The further requirements for participation and for exercising voting rights can be found in the invitations to the Meetings. How can a shareholder register for the Meetings? The shareholders, i.e. holders of common shares and holders of common non-voting shares, will receive an invitation to the annual general meeting together with the agenda for the annual general meeting via their custodian banks. In addition, holders of common non-voting shares will receive an invitation to the special meeting of the holders of common non-voting shares meeting together with the agenda for the special meeting of the holders of common non-voting shares via their custodian banks. By means of a reply form attached by the custodian bank, the shareholder is given the opportunity either to commission his bank to exercise his right to participate and vote (to the extent she/he is entitled to such rights in the annual general meeting and/or in the the special meeting of the holders of common non-voting shares) or request an admission ticket for himself or for a representative from his custodian bank. The custodian banks will forward these requirements to the registration office commissioned by Schaeffler AG. The invitations to the Meetings were published in the Federal Gazette on March 12, 2018 and since then have also been made available for download on the Schaeffler AG website. How many votes does a shareholder have in the Meetings? 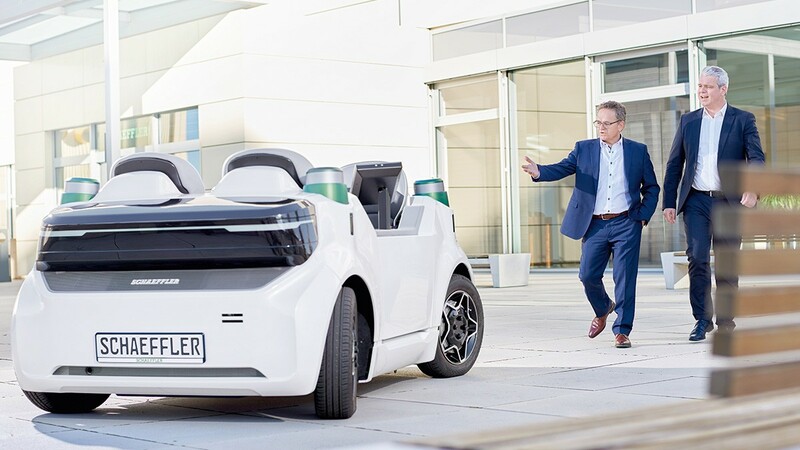 Schaeffler AG’s share capital is divided into 500,000,000 common shares with an equal number of voting rights and 166,000,000 common non-voting shares. The portion of the share capital allocated to each of the no-par-value shares amounts to € 1.00. Pursuant to sec. 140 para. 1 German Stock Companies Act (“Aktiengesetz” – AktG), the common non-voting shares have no voting right in the annual general meeting. The common non-voting shares also have no voting rights in the annual general meeting pursuant to section 140 para. 2 sentence 1 AktG. Unlike is the case in the annual general meeting, only holders of common non-voting shares are entitled to vote at the special meeting of holders of common non-voting shares. The total number of voting rights in the special meeting of holders of common non-voting shares corresponds to the total number of common non-voting shares and therefore, at the time of notice of convening of the special meeting of holders of common non-voting shares, in the Federal Gazette, is 166,000,000. Can a shareholder be represented at the Meetings? Shareholders who cannot or do not want to personally participate in the annual general meeting and holders of common non-voting shares who cannot or do not want to personally participate in special meeting of holders of common non-voting shares are given the opportunity to appoint an authorized representative. Authorization may be granted to proxies designated by the company (Stimmrechtsvertreter), a bank, an association of shareholders, another person or institution with equivalent status pursuant to sec. 135 AktG (if they each offer proxy voting and to the extent the shareholder is entitled to vote), or another third party, e.g. a personal confidante who attends the annual general meeting on behalf of the shareholder and/or the special meeting of holders of common non-voting shares on behalf of the holder of common non-voting shares. What should shareholders do if they have not received an invitation to the Meetings? The custodian banks send meeting documents to the shareholders. The shareholders should therefore contact their custodian bank if they have not received an invitation to the annual general meeting by early April. The aforesaid applies accordingly to holders of common non-voting shares with respect to invitations to the special meeting of the holders of common non-voting shares. The invitations can also be viewed on the website www.schaeffler.com/agm and in the Federal Gazette. What should shareholders do if they have registered for the Meetings on time but have not received an admission ticket? A shareholder who has registered on time and has not received an admission ticket can still attend the annual general meeting and, in the event of a holder of common non-voting shares, still attend the special meeting of the holders of common non-voting shares. If the admission ticket was issued and simply did not reach the recipient by mail (on time), the shareholder is listed in the registration record. This can be checked on site at the special counter. Are shares frozen when the shareholder registers for the Meetings? Only those shareholders who have provided proof of the right to participate in the respective Meetings and/or to exercise voting rights as a holder of common shares in the annual general meeting or as a holder of common non-voting shares in the special meeting of the holders of common non-voting shares are deemed to be shareholders with respect to the annual general meeting, and holders of common non-voting shares with respect to the special meeting of the holders of common non-voting shares, of the company. Proof of shareholding as of March 30, 2018, 00:00 (CEST) (“Record Date”) must be provided. This means that shareholders who have acquired their shares after the Record Date, 0:00 (CEST) cannot attend the Meetings absent an effective power of attorney. The Record Date does not prevent a sale of the shares. The Record Date is also not a relevant date for the dividend entitlement. Can I participate in the Meetings if I have already resold my shares? Participation is based on the Record Date, i.e. March 30, 2018, 00:00 (CEST), timely registration for the Meetings, and the submission of proof of shareholding. The subsequent sale of shares has no influence on the right to participate. Who has voting rights in the Meetings? Unlike is the case in the annual general meeting, only holders of common non-voting shares or their authorized representatives have voting rights in the special meeting of holders of common non-voting shares. As a shareholder, can I leave the Meetings temporarily and come back later? The shareholder can temporarily leave the Meetings via the exit desk. When leaving, however, he must sign out at the exit desk and, when returning, sign in again so that the list of participants can be updated accordingly. The shareholder must register with his bank early enough so that the registration is received at the registration office no later than the last day of registration, i.e. by 24:00 (CEST) on April 13, 2018. Where can the relevant documents for the Meetings be viewed? When and where will the 2018 Meetings take place? The Meetings take place on Friday, April 20, 2018, at the “Frankenhalle” of the “NürnbergMesse” GmbH, Exhibition Center, 90471 Nuremberg. The annual general meeting starts at 11:00 (CEST). Admission to the building begins at 10:00 (CEST). The commencement of the special meeting of the holders of common non-voting shares follows the same day’s annual general meeting and starts no sooner than 1:00 p.m. (CEST). How do I travel to the Meetings and where can I park? The exact duration of the Meetings cannot be specified in advance. The annual general meeting starts at 11:00 (CEST) and admission to the building begins at 10:00 (CEST). The commencement of the special meeting of the holders of common non-voting shares follows the same day’s annual general meeting and starts no sooner than 1:00 p.m (CEST). Will Schaeffler AG pay a dividend in 2018? At the annual general meeting on April 20, the Board of Managing Directors and the Supervisory Board of Schaeffler AG will recommend the payment of a dividend of € 0.55 per common non-voting share entitled to a dividend, and a dividend of € 0.54 per common share entitled to a dividend for the 2017 financial year. When will the dividend for the financial year 2017 be paid? The dividend for the financial year 2017 will be paid on April 25, 2018. The dividend payment is made irrespective of whether or not a shareholder has participated in the annual general meeting. The dividends will be paid to the shareholders whose share is in a securities account at market close on the second business day following the annual general meeting (i.e. on April 24, 2018). Motions to amend the agenda are also published in the Federal Gazette and distributed throughout Europe, and are expected to be reported to the shareholders along with the notice of the convocation of the Meetings pursuant to sec. 125 para. 1 sentence 3 AktG. How and where can shareholders register to speak at the Meetings? Will there be a webcast of the Meetings? A webcast of the opening of the annual general meeting by the chairman of the meeting and the speeches of the chairman of the Supervisory Board and the Chief Executive Officer in the context of the annual general meeting is planned. The live webcast can be watched at www.schaeffler.com/agm starting at 11:00 (CEST). The webcast will end when the general debate starts. The webcast of the opening by the chairman of the meeting and the speech of the Chief Executive Officer will also be available after the event at the stated address. There will be no webcast of the special meeting of the preferred shareholders. Will the complete minutes or a complete video or sound recording of the Meetings be available? No, these will not be available. Neither minutes nor a video or sound recording will be made of the proceedings of the Meetings.